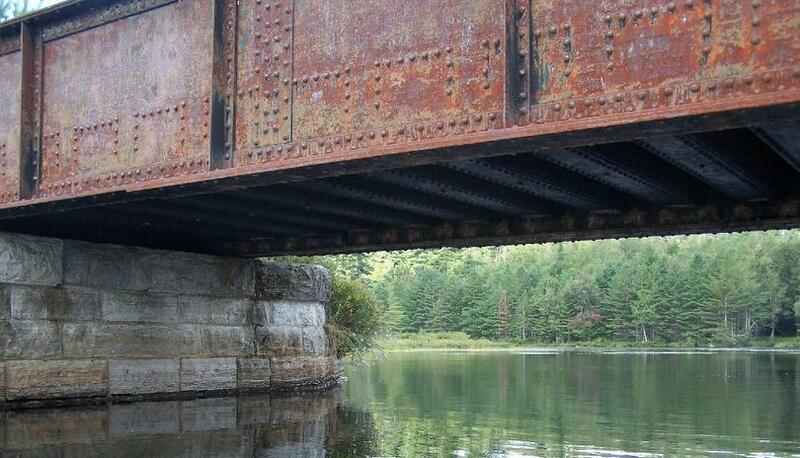 Lows Lake is a reservoir in the Adirondack Park in northeastern New York. 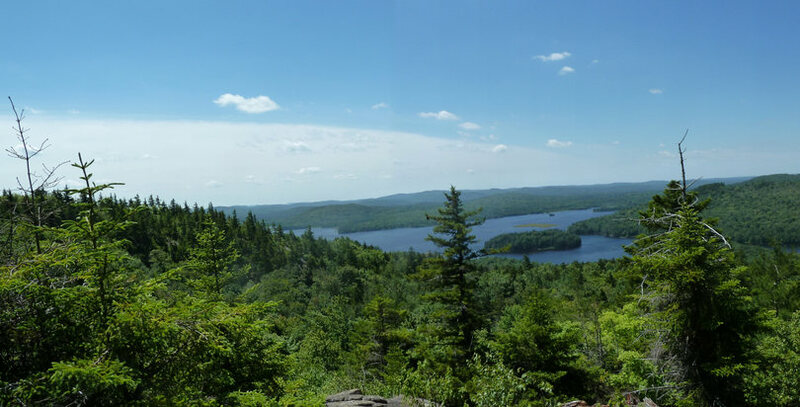 It is located in the Five Ponds Wilderness Area, 10 miles (16 km) southwest of Tupper Lake. The lake is part of the Bog River Flow. While it is largely surrounded by New York State Forest Preserve, the northeast shore is privately held, along with a few small parcels that border the lake. The lake lies within the towns of Colton, Clifton, and Long Lake. The lake was named after A. Augustus Low, son of Abiel Abbot Low; Low owned 40,000 acres (160 km2) in this vicinity early in the 20th century. 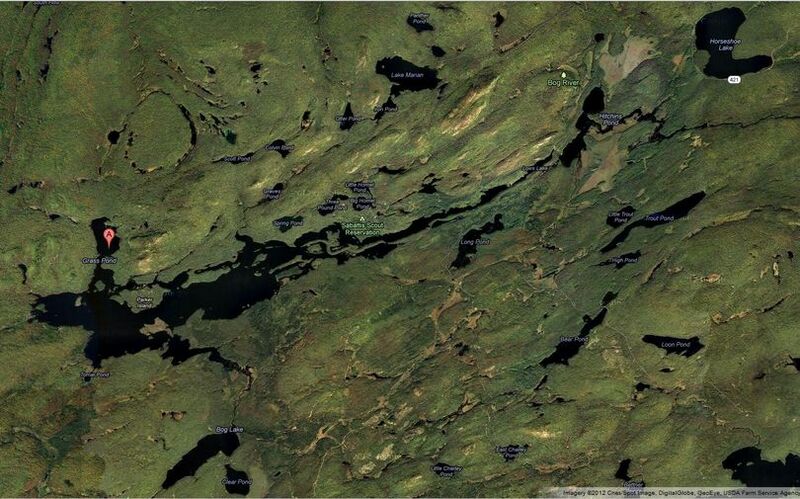 Low constructed two hydroelectric dams along the eastern portion of the Bog River Flow; the upper dam, where most of Low’s main buildings were located, created Lows Lake. On the granite ledge above the second dam, there is a plaque commemorating the Low’s memory. His ashes were spread from the ledge. Sabattis Scout Reservation owns a portion of the lake with three islands and has a Boy Scout camp located near the mid-eastern and northern portion.The state owned lands along Bog River between Lows Lower and Upper Dams and at Lows Lake offer an opportunity to enjoy over 14.5 miles of scenic waters with only one short carry around Lows Upper Dam. Navigability of this route was established by the two dams built by A.A. Low in 1903 (Lows Lower dam) and 1907 (Lows Upper dam). 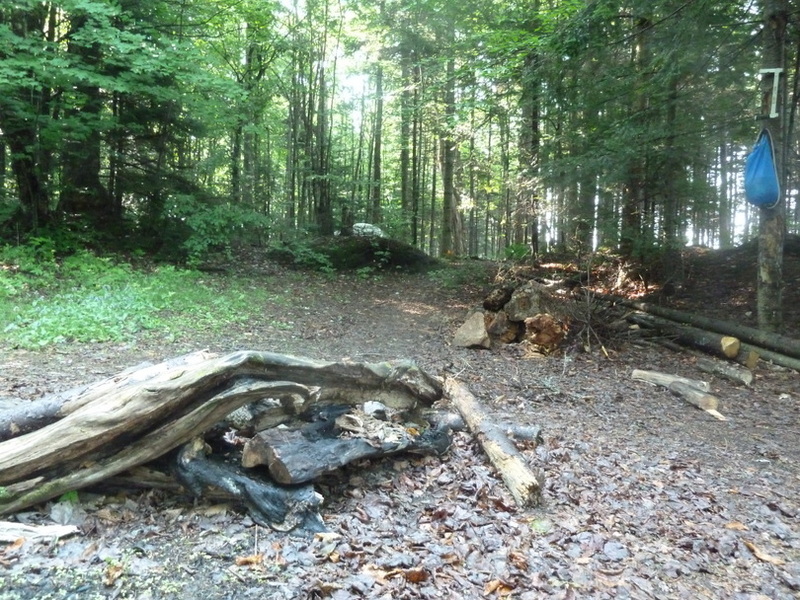 Public access to the area is by a short gravel road (sometimes gated in the spring to protect it during frost-out) off State Route 421 to Lows Lower Dam, where a canoe may be launched. We decided to go canoe camping before 4th of July week at Lows Lake. Our plan was to meet Skip at the Long Lake Diner at 9am and proceed to Lows Lake. 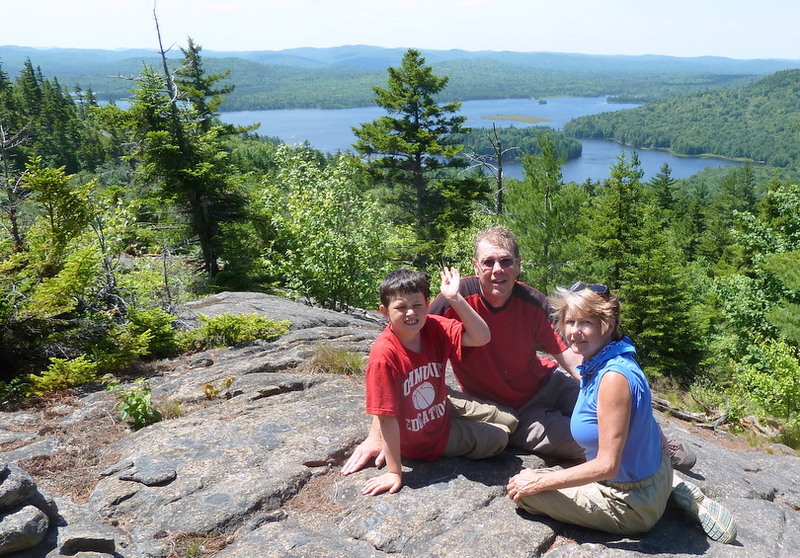 Our goals were to camp on Grass Pond, bushwhack to the top of Grass Pond Mtn and possibly canoe/explore Bog Lake. We were on the water at 10:45 and observed that most of the people signed into the register were destined for Hitchins Pond with minimal numbers planning on Lows Lake. The launch at the lower dam leads one upriver two miles to Hitchins Pond. Another shallow body of water, Hitchins rarely gets as rough as Lows Lake. On the way in across Hitchins Pond I told Eric the story of coming to Lows Lake a couple of years after it opened in 1985 with Rich Roman. There was a threat of rain in the forecast so I threw an extra rain jacket in the car and offered it to Rich at the put-in. Rich declined stating that it wasn’t going to rain and, of course, he didn’t need a rain jacket if it did. As we paddled across Hitchins Pond I pulled on my rain gear as it increased in intensity from a sprinkle,to shower, to rain, and then downpour. Finally we coasted to a stop under the railroad bridge where a soaking wet Rich accepted my offer of a garbage bag which he cut holes for his head and arms. At the upper dam there are options for portaging around the dam, one option is to paddle up the outlet and drag your boat and gear up the embankment. 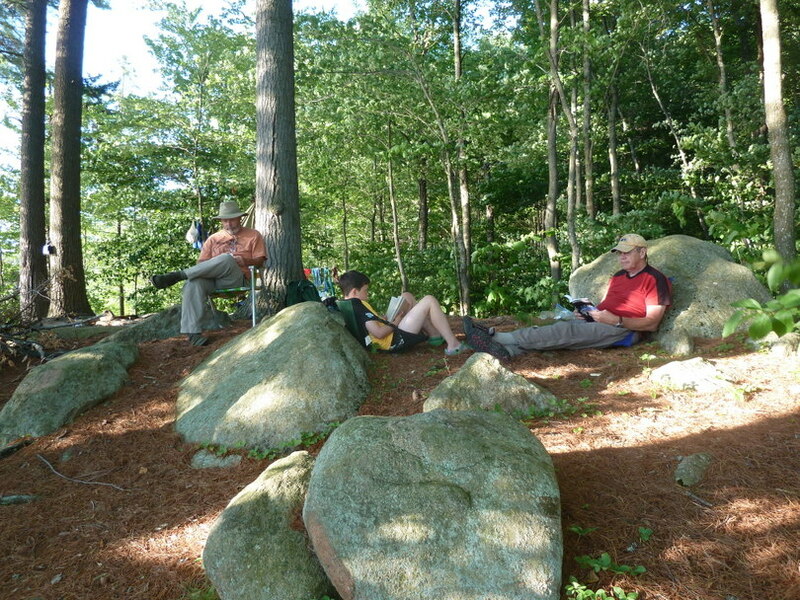 We chose to utilize the picnic grounds; a little further to walk. 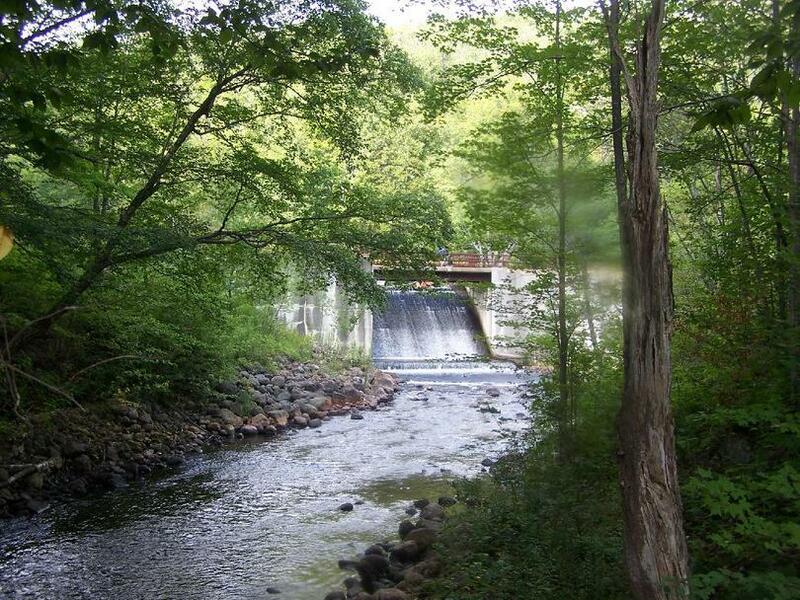 A short carry from Hitchins Pond leads over the upper dam and into Lows Lake. The first seven miles up the flow are quite narrow and not often windy. Once you get past the Boy Scout Camp on the right shore, the lake begins to widen until a second narrow passage is reached about one mile further along. Once through this channel, a view of Lows Lake proper is achieved, and you are greeted with the usual white-capped waves. 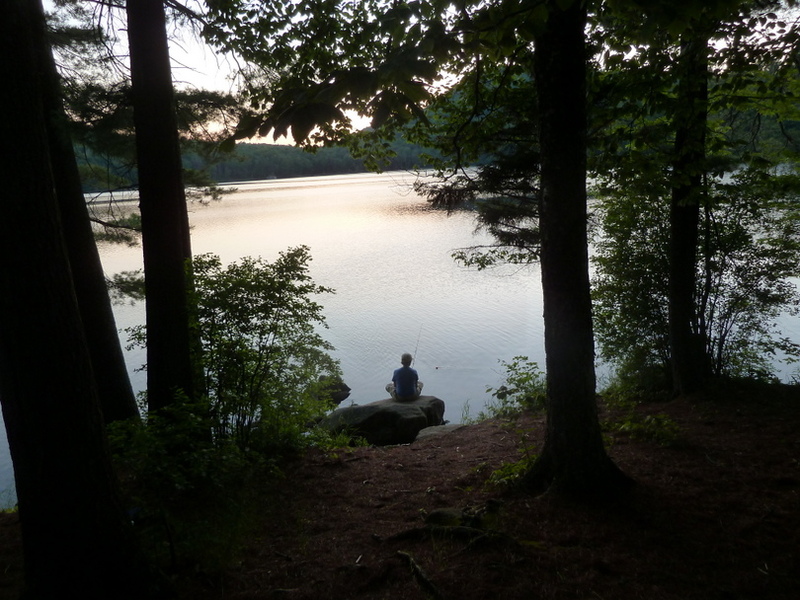 Lows Lake is speckled with several beautiful islands, but camping is limited to a few numbered sites. Shortly after leaving the upper dam we encountered the floating bog. The floating bog is fully blocking the river channel. Going upstream we were able to line/drag over a mucky 5-yard stretch on the far left, then get back in the boat and paddle to the far right thru a passage in the bog and squeeze through. We stopped on an island near the boy scout camp, stretched our legs and ate a quick lunch. As we neared the main body of the lake we were slightly concerned about wind blown waves. We decided to paddle along the north shore, stay behind the islands and investigate the two portages. After completing the 1st portage we re-entered the main body of the lake where conditions were not bad and paddled to the entrance to Grass Pond. Kathryn set a rapid tempo and Skip struggled to keep up in the solo canoe. Coming into Grass Pond we caught up to and pulled along side another couple that were also destined for Grass Pond. Not knowing if there would be empty campsites and feeling guilty for ‘racing’ by the other couple I offered campsite #29 to them; “Site 29 is open if you want it, it’s yours.” They declined stating there was a particular site they wanted (I assume #31 – same as us). By declining our offer it was on! With Kathryn’s pace there was no way they would catch or pass us so we proceeded to #31 and found it and #32 occupied. A quick search of the other sites was disappointed so we headed back out to the main lake. As we passed #29 we found it empty – the other couple must have decided they weren’t going to catch us and they preferred a site on the main lake over those at Grass Pond. At this point we had paddled 12+ miles over 5+ hours and were ready to be done. So we settled in at site #29, which was a nice site except for a muddy beach and lack of a swimming area. Eric started our fire in a recently cleaned out fire pit and Kathryn made lemon chicken and pasta for dinner. After dinner Eric and I fished from the canoe for a short time with a few bites but no catches. We had overnight thunderstorms, but had put all our gear under the tent vestibules. 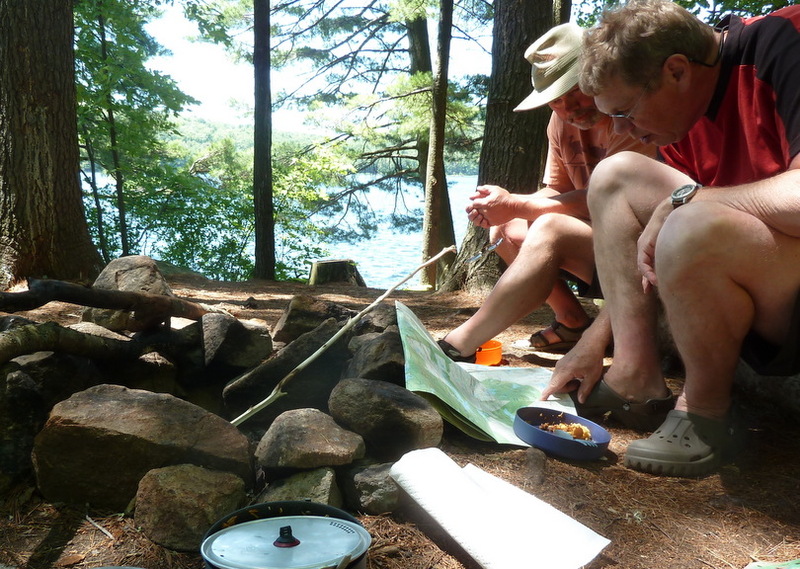 After a leisurely breakfast, we decided to paddle over the Grass Pond Mtn access and check out site #31 on our way. As luck would have it we met the previous occupants coming off the site, so we turned around, broke camp and transferred our tents and gear to #31. About 10 years ago Kathryn and I stayed at site 31 with Matt and Beth. It is a large open site on a small point. The site is under large white pine trees on a slight rise from the water. The front of the site gets good sun in the afternoon/evening with a sitting rock at water’s edge for a perfect view of the sunset, and a good swimming area out front. The back of the site has 3 shady areas for additional tents plus a privy up on the hill. 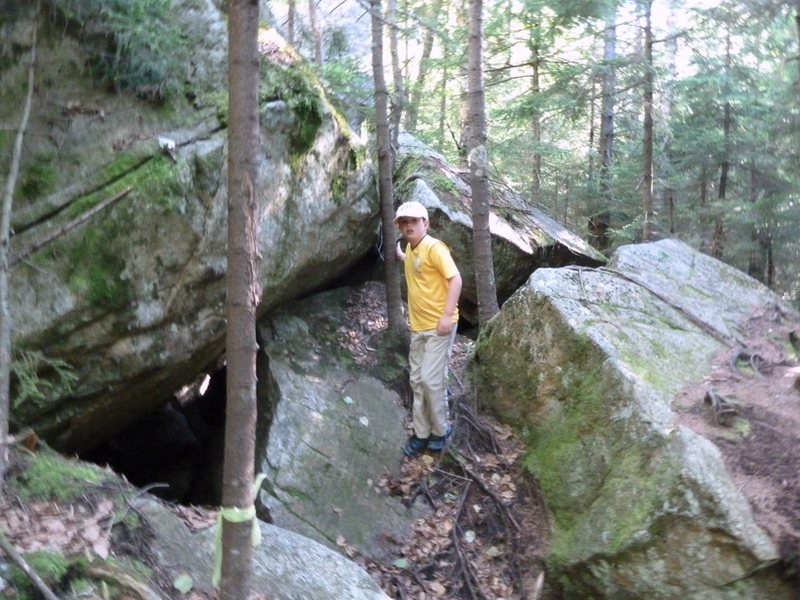 That afternoon took a short walk to the “Ice Caves” by following an old jeep road until it passes the 2nd culvert. Just before the creek is a herd path marked with flagging tape. It is a short 5-10 minute hike to reach the cliffs and the ice caves which hold the winter’s snow within the talus slope. Unfortunately, given the unusually warm and snow-less winter we had there was no snow or ice in the ‘caves’ but they were refreshingly cool. Eric was fascinated by them. After our hike we went swimming, ate some of Kathryn’s delicious Spanish Rice for dinner and planned our assault on Grass Pond Mtn. 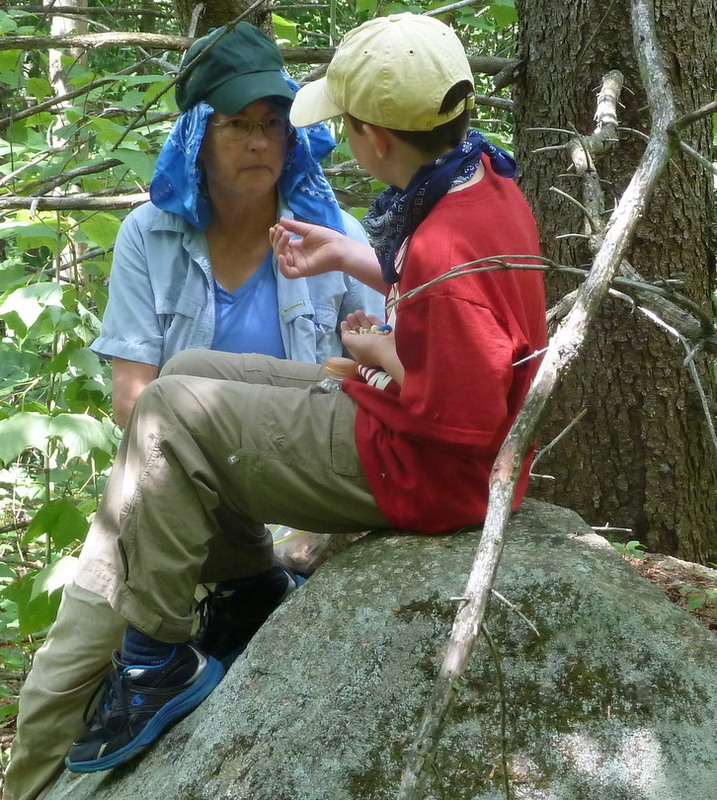 Eric shares his GORP with Kathryn during one of our bushwhack breaks. Grass Pond Mountain climbs to 2,244 feet (683.97 meters) above sea level. 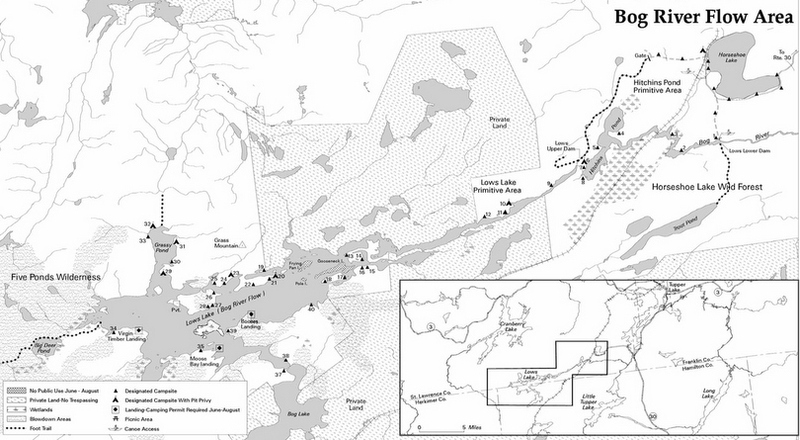 Grass Pond Mountain is located at N 44.093395 and W -74.776292. 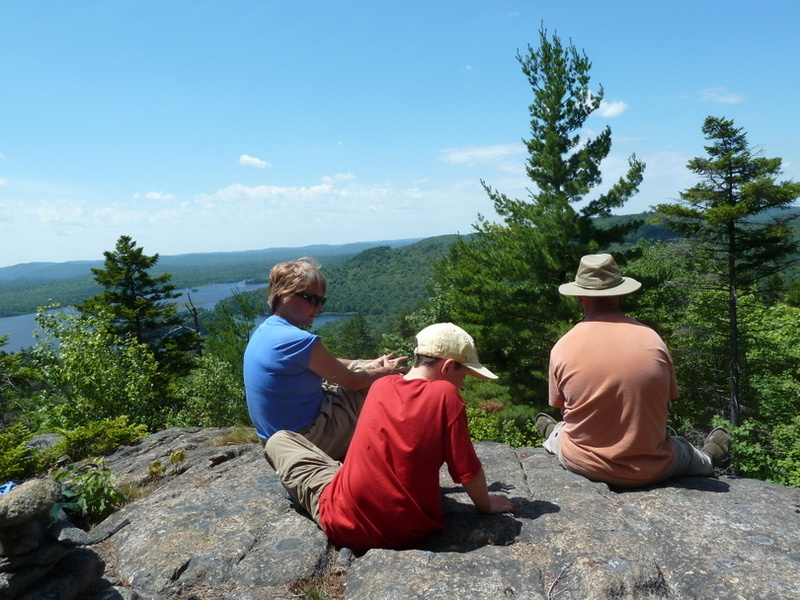 The bushwhack / scramble up was rewarded by fantastic views of Lows Lake. We took lots of pictures, ate our lunch of bagels, summer sausage, cheese and gorp and generally hung out. From our vantage point we could see major whitecaps on the main lake. Upon our return we all went swimming. Kathryn stepped into a leach ‘nest’ resulting in one large leach and 6-10 small baby leaches attaching to her toes. The large leach freaked her out and she required assistance in removing the larger leach. Afterwards we sat and read. Saturday night Kathryn and Eric caught several small bass fishing from the campsite. Sunday morning we woke early and paddled out with a slight tail wind. 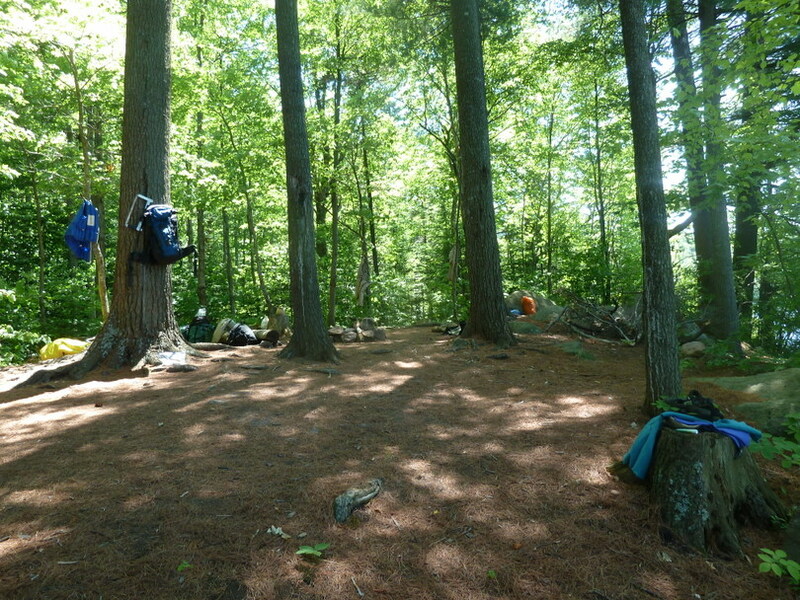 We encountered a group of 8 people / 7 canoes from the Albany ADK Chapter in the midst of a canoe camping loop. 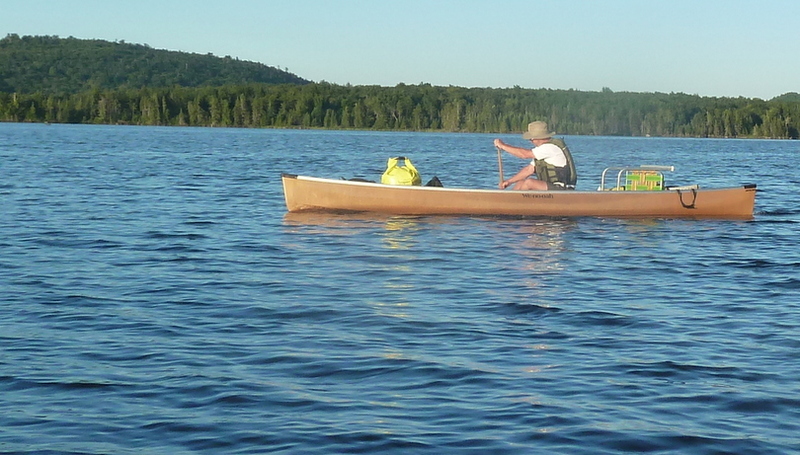 They started on Little Tupper, canoed to Lake Lila, portaged into Lows Lake on and were taking the Lows Lake outlet back to Round Lake and Little Tupper. One of the group had developed blisters and was opting out of completing the trip. We had a nice chat on the way out and Skip gave him a ride back to his car at Little Tupper. We were blessed with great weather throughout our trip. We managed to secure an ideal campsite for swimming and hiking. Great Trip!